In one of my first articles I gave some tips to improve the positioning of a website, in this article I will show you how to create an effective SEO strategy. As an SEO consultant I have developed many effective SEO strategies for my different projects. In this article I will define the steps that must be followed to develop an effective SEO strategy, at least that is how I do it. It is known all over the world that if you do not go out in the first 2 pages of the search engines, you are nobody on the internet. 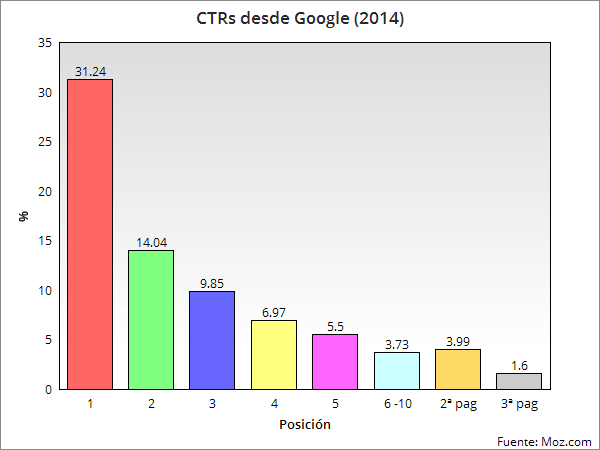 In the following image you can see the distribution of the CTR of the results in Google. We see how the first result takes more than 30% of the clicks, and that the first page takes more than 90% as a whole. I think it’s a good reason to climb that first page, right? But it does not appear by magic in the first positions, you have to work on it. For this it is necessary to plan an SEO strategy, Let’s go to them! The first step to make an effective SEO strategy is to be clear about the objectives that the client wants. A person without a clear business idea will tell you that he only wants more visits, that is a mistake. An e-commerce can have several objectives for example, from increasing the number of sales, the average ticket or reducing the abandonment of shopping carts. A services page will aim to capture leads, while a blog will want to increase the number of users and reduce the bounce rate. The objectives set must meet the SMART theory (specific, measurable, achievable, realistic and in a marked period of time). That is, realistic objectives, that are measurable and in a short / medium period of time. What I want to show with this first point is that the selection of objectives is not so simple, and that it is something fundamental for a good planning of the strategy. Once we have the objectives set, and we know the competition, we move on to the second point. We have to analyze the audience we want to reach, and to reach them we have to select the most relevant keywords. For this the best way is to use the Google AdWords keyword planner. With this tool we will know which words are the most sought after and their volume, so for example we will know which keyword is best for an effective SEO strategy, “law firm” or “law firms”. The correct way to do this is to open an Excel, and create categories with your services or products. Then you will have to search for a main keyword per service / product, and at least 2 secondary keywords. In the next 2 photographs I show it very well. In this case it is a job for a law firm. If we only look at the average of monthly searches we would choose the word “law firm” that will have more searches. But there is no point in having more searches if there are many more results. For this it is necessary to make that rule of 3 that we see in the second image, in the excel. Index tag: you have to put this tag on all the pages, but the search engines will not show them in their rankings. By default they are activated. If you have a page that you do not want to be indexed, you must put the NOindex tag. Robots.txt file: with this file what you do is block Google bots from entering your most private pages. For example, in WordPress, the administration page is / wp-admin /, as it is serially blocked with the robots.txt file. In the following image we see the robots.txt file of my web page. It looks like everything is allowed except the entry to my website. The robots can not reach that page in any way. Creating quality content: The more and better content you have, the more time users will stay on your website, the more actions they will do, and therefore Google will put it higher in the ranking. The content must be addressed to people, before text was put to please Google, and should provide value. Internal links: it is important not to have broken links on the web. In addition, the more internal links you have, the more information you will give to search engines on your website. That is why it is so important to have a blog on a web page. Sending Sitemap: the sitemap is a summary of the distribution and pages of your website. Google will make your own, but if you send it you will be facilitating your work. Loading speed: it is necessary for the site to load fast, if it takes more than 3 seconds, Google will penalize it. For this it is necessary to have a good server, and with a good optimization of the web page. The SEO Off Page is the one that is elaborated in web pages foreign to ours. The way to do it is with a linkbuilding strategy. That is, getting links from other pages to make yours. It is difficult, especially at the beginning, but you can always start using publishers or talking to other companies to exchange a couple of links. Google Analytics: the summary of this tool is the DATA. With them you have a starting point of all the data related to digital marketing on your website. You will have to see if each time you have more users, and if the behavior of these has improved. Google Search Console: with this tool you can know the number of links to your website, both internal and external. In addition you will be able to know how is the situation of your sitemap. In short, this tool will help you to know the status of your website. With these 5 steps you can develop an effective SEO strategy for your website, whether personal or brand. The process of web positioning is slow and more complicated than it seems, so I always recommend contacting an expert. I trust that this article will be useful.